Last week, I had a great lunch with a friend here in town who owns a marketing firm that has a particular emphasis on social media. One of the things we discussed is the changing face of marketing. What is also changing is the role of sales and salespeople. My company is really starting to focus on changing how we sell and market based on what I am seeing in the industry. The whole topic gave me the idea for today’s post. I’m going to start it off with this chicken and egg question – which came first – marketing or sales. Talk to a Salesperson and they will tell you it was them knocking on doors and making calls that brought the people to the door. Talk to the marketing department and they say “ well, heck no, if the customer had never heard of our product, the sales person wouldn’t have gotten to first base.” That’s why I call it a chicken and egg question. Which aspect indeed is first? Often, I run into organizations who think they are one and the same – to which I say, absolutely, unequivocally, NOT. And if that organization thinks this, they are probably in trouble or going to be soon. There are different rules and techniques required for each process. And that’s what is changing. And it’s changing for both sales AND marketing. Social Media and Social CRM are rapidly changing how we interact with our customers. It’s no longer a push situation – it’s a two way communication model. The customer indeed wants to hear about the product or service and wants to talk pricing. But after they have gotten the product, they want the dialog to continue. They want the ability to complain or compliment or suggest or comment on an ongoing basis. Recently I read an article that “claimed” the sales person was going to become obsolete. Websites, online marketing, “here kitty kitty” advertising, Facebook, all of the above would drive customers to buy. Sales people would become an unnecessary burden and expense. Humph. I don’t agree. But I do agree how people sell will need to change to accommodate the new emerging online model. It used to be that the role of salespeople was to advise customers of products and solutions. The savvy customer can now find that on their own. So, why would you need a salesperson? The fact that the customer can find it out on their own is why you need a salesperson. The customer is probably overwhelmed with too much information and needs someone to help them figure out what’s right and wrong for their requirements. The salesperson role is changing to that of a trusted adviser who knows what’s up and can help guide you, hopefully honestly, thru the morass of information to a workable solution. My advice for salespeople is to become very literate with the internet tools. Know what it means to be on Twitter. Sign up for Linkedin, the world’s largest old boy network. Join groups on Linkedin that are pertinent to your product and services. Become a voice, and not just a lurker. If you don’t, the new young guy following behind you will. This is the world of the future, trust me, and it behooves salespeople to embrace it and become proficient social media pundits. Or wait by the wayside while the other guy does. Is Twitter getting too big for its britches? Today I received some bad news. And it has not made my day. Basically it means I’m going to have to do more work. Not that I mind work. What I mind is having to redo something I already put in place to be better organized. The post today will be my rant about what caused the bad news. Last month Twitter announced stricter rules regarding the use of their API. There were a lot of reasons quoted by the company for the rationale. None of them made sense to me. And it has caused me to rethink my social media updating strategy. Let me explain why. I use Twitter as my tool for updating both Facebook and Linkedin. I, like many people, have a real job and need to spend most of my day running my business. Social media is important to my business and my marketing efforts, but it’s not the sole thing I do all day. Therefore, I need tools and processes to make this happen. For a couple of years now I have been writing in one place, but posting in many. This has enabled me to be very active on the Social Media front without impacting my business. This new ruling means that has to change. I spend very little time out on Linkedin. I have to say it’s because I find it too busy. It’s hard to find information and I don’t have time to weed thru minutia. Tweet Deck helps a bit. This application is just what Twitter is trying to hurt. They want everyone driving to the Twitter site and not using tools or aggregators as they are called. Guys, that’s a sure way to make me stop using Twitter at all. One of the rules implemented in June said developers should not use Twitter APIs to mimic or reproduce the mainstream Twitter consumer client experience. In other words, don’t make it look like Twitter. I don’t believe Twitter patented the way their product looks. At first, this didn’t seem like a big deal when I originally read the announcement in June. That’s where the “bad news of the day” comes in. The bad news is something that was going to show up in a tool I use, won’t be there. Because of this new ruling. When I went out to research the ruling, I found out about Linkedin and Twitter severing their ties. Ouch. That hurt. That meant my tweets couldn’t post to Linkedin. Ok, now I’m annoyed. Especially since I found out this ruling will affect another application I use heavily. That application was hoping to leverage the ability to aggregate social media streams into one place and now Twitter won’t be part of that aggregation. Grr. When you look at all the companies, particularly in the CRM space, that have been busy buying up social media applications so they could provide social media interfaces and aggregation of posts, you have to ask yourself what was Twitter thinking. Or were they thinking at all? Has Twitter gotten too big for their britches? Or are they just trying to lure people to Twitter sites so they can spam us? My gut feeling is this is the case and from what I’m reading, that’s what others believe as well. It’s all a corporate game and we the end users are the chess pieces. Gosh, I hate being a pawn. To say this has made me grumpy today is an understatement. Now I have to rethink my updating strategy. As if I didn’t have a million other things to do. Enough ranting. Got to get back to work. More on this topic later. Starting with Sage ACT version 2012, you can now create some nifty Excel pivot tables using what is called a Star schema. The data goes after histories and opportunities. It’s a bit complicated to set up, but once done you can start to do some sophisticated drill downs in Excel to show history records. 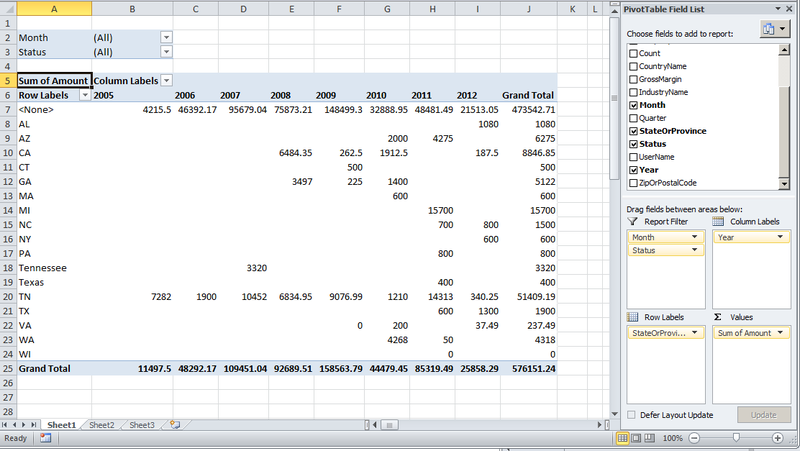 Here’s a screen shot of one pivot table I just created. The setup took longer than creating the table. Here’s what you need to do to get access to this data in ACT. Note – this is really geeky so you may want to find your local IT person to help out – or send us an email at pregen@egenconsulting.com and we can quickly set this up for you for a small fee. You need to do this on the machine that is hosting the database with your data. 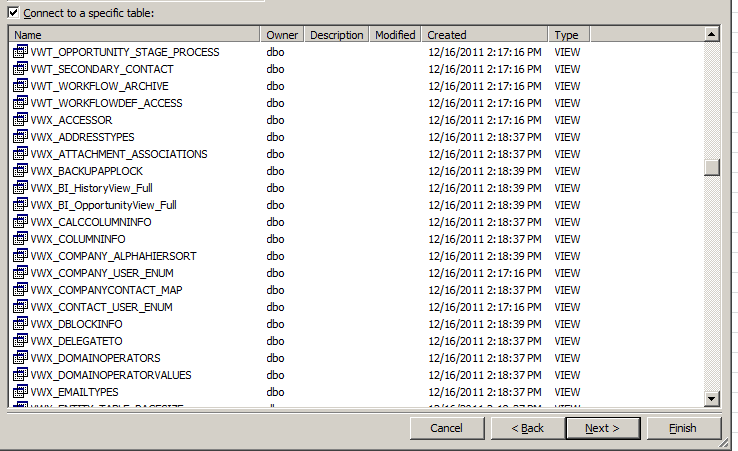 Using the free SQL Management studio, you logon to SQL Server and point to the ACT! 2012 database you want to refresh. Here’s a series of screen shots of what I did to connect to our own database. The shot above is where I point SQL Management studio at my ACT SQL . Next I located my database. I right clicked on the database name and chose NEW QUERY. That brought up the following empty query box. Into this box I pasted the following commands. It’s these two views that have the magic. After the views have been created, you can close SQL Management studio (see below on how to download SQL management studio for free). You are now ready to look for this information using Excel. 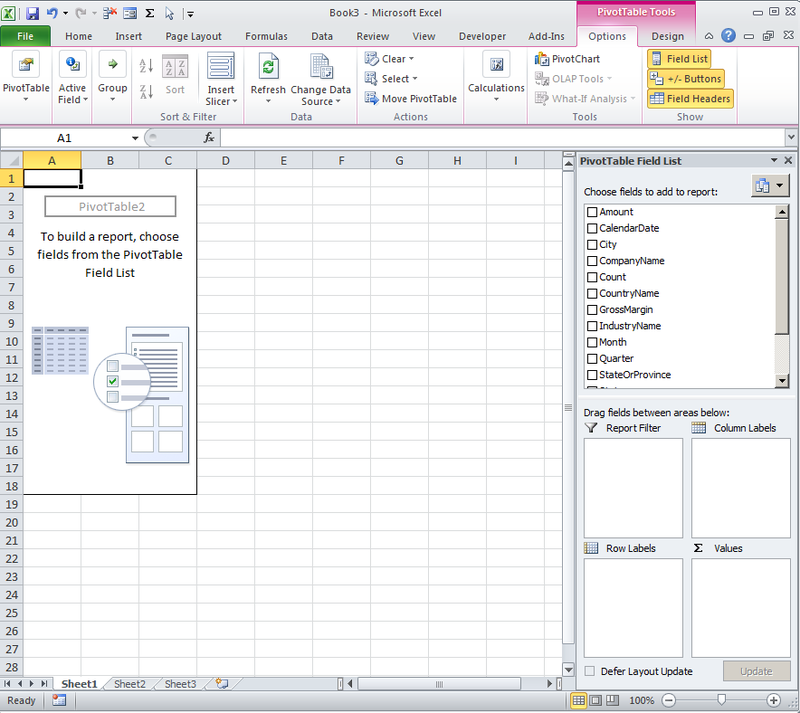 The instructions coming up next are for Excel 2007 or 2010. Email me and I can send you instructions on how to do this on older versions. In the case above, since I am going after the data on a machine other than my own, I need to provide a username and password to access the internal data. You cannot use your normal ACT username and password. If this was on my own computer, and I was going after a database running on my own computer, I could use the windows authentication. In the case above though, I want to go after the main database on the server so I am using the ACTREADER login. 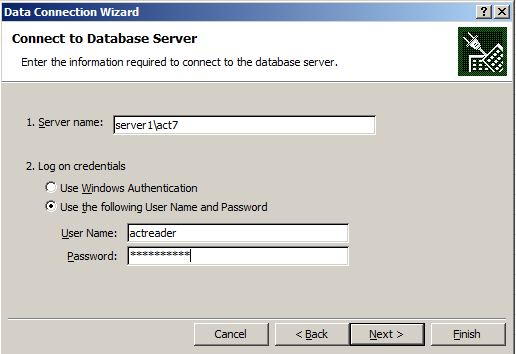 The ACTREADER logon is a great way to get to data without having to know the System Admin password. It comes free with Sage ACT. All you have to do, one time only, is run a little program called ACTREADER which lives in the Program Files\ACT\ACT for windows folder. When you run the program it will ask you for a password. Enter one of your choosing and write it down so you can remember it later. You can run ACTREADER on your own computer and it will work for databases, like remotes, that live on your computer. 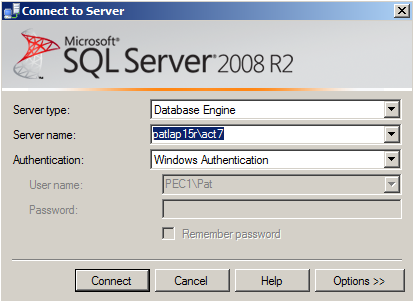 If you want to run it against a server-based database, you need to run the ACTREADER program once on the server, set the password and then the password is set FOR ALL databases on that server. After entering the server name and username and password, you click NEXT and choose your database from the dropdown. In the box shown below I am going to choose PEC_Master. Make sure you check the Connect to a specific table box. It will display a set of tables. 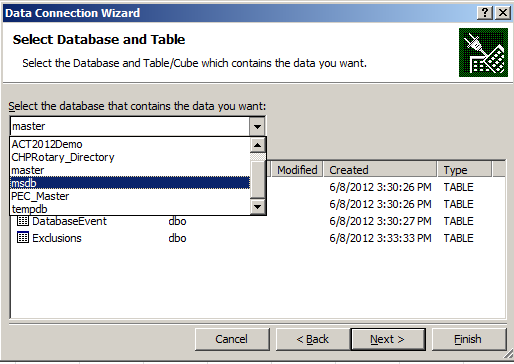 Scroll down until you see the VWX_BI… tables as per the example below. 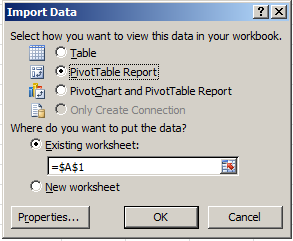 Click on one of the BI.. tables and then NEXT and FINISH and then choose PIVOT TABLE REPORT and a location for the table. Let it default to $A$1. You now have a blank Pivot Table with fields to the right that you can start dragging and dropping into the Pivot Table Layout. The first image in this blog article was done using the Histories table. The one below is using the Opportunities table. They say the economy is getting better – well, maybe It’s an election year so people are being cautious with their money as they await the outcome in November. The market is like a yo-yo and job reports are even gloomier. What this all means is we as business owners need to find creative ways of generating income and revenue. This can be marketing campaigns, reducing prices, and even looking at new ventures or ideas. So which direction do you take? How do you know what avenues you should travel to find that pot of gold? I believe it’s living right in front of you inside your customer data. The time old expression of looking for gold in “them thar hills” doesn’t just apply to gleaming metal deposits. It also applies to business data that lies hidden behind minutia in your database. It is the old adage – you can’t see the forest for the trees. If you frequent my blog, you know we support Sage ACT, a contact management application. Its main purpose in life is to keep track of everything about a customer, all in one place. If it is being used properly, it is loaded with data gems for you to mine. Here are some things that I suggest you look for in whatever system you use to keep track of your customer interactions. What I am going to be describing and recommending here pertains to ACT but I think you will get the main idea and can probably do something similar in your CRM of choice. First off, as I’ve said before in other blog articles, it is cheaper to go after current clients than to find new ones. Therefore the first set of recommendations is geared towards your existing customers. A good CRM application will allow you to search for data based on dates. Try looking in your data for customers who have not been touched in any way for a year. 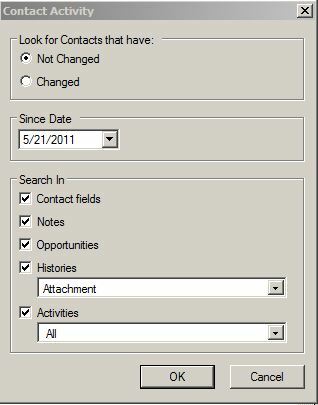 In ACT , this is as simple as clicking on Lookup – Contact Activity – and then choosing “Not Changed”. Use the resulting lookup to develop a call campaign. Send them marketing materials geared at “bringing them back” – offer them reduced services or provide coupons for price reductions. If you have started using social media, point them at your Facebook page and Twitter account. Set up a “smile and dial” day in the office and assign a group of names to each of your staff. When you call the clients, ask them why they haven’t called on your services or bought your products recently. It is helpful to know why a customer has stayed away. Are they out of business? Have they moved in a different direction? You can use the results of the questions to help develop other approaches to bring back “missing in action” customers. I have found that reaching out to a long lost client has some interesting results. It is very common to hear them say “I’ve been meaning to call but have just been focusing on business.” Haven’t we all. That’s probably one main reason these clients haven’t done business with you recently – it’s because you have been wrapped up finding new clients or working with ones who have called you. It is a case of getting caught up in day to day activities instead of doing heavy duty marketing and cold calls. And yes, even if it’s an existing client, it’s a cold call because you are making the call out of the blue. Those are tough – I don’t like to do them and neither does my staff. We’ve been doing a campaign recently to let customers know about new products and services we are offering. It is actually working. Using reporting or dashboards, look for trends in your data. Are you selling a lot of a particular product? Are you selling into a vertical market, such as hospitals, medical fields, manufacturing or service industries? If you are not seeing a particular industry, look at ways to attract customers from that market. Buy lists from sources such as Hoovers or InfoUsa. Import them and focus an email and call campaign around those markets. Another area to look at in your data is location. Charts and graphs can quickly help you identify data by state, city or zip code. This is what I call data lost in minutia. We tend to focus on one client at a time, or a group of clients in a region. Having a way to see the data from 50,000 feet enables you to identify opportunities. Here’s a real example from my own database. The following dashboard shows contacts by state and the right panel shows states with no contacts. That has become a mission of mine now – to get at least one customer in Wyoming. Looking at your data on a day by day basis, you miss things like this. Using a similar approach, look for trends with products sales by day of the week. One of my clients had an ingenious idea. He asked me to build him a dashboard that showed which day of the week had the most opportunities created. He also wanted to know which day of the week had the most call volume. Based on the results shown on the dashboard, he had some of his staff come in on each day of the week. They then tracked how many sales were achieved by day of the week. He did this for two months. Immediately they noticed that for their business, Tuesdays and Thursdays were high selling days. It totally changed his approach and increased his revenues by 20% the first three months. Again, his staff was lost in their day to day routine. They were not paying attention to which day brought in the most revenue. By taking an innovative and focused approach, they got great results. There are lots of fancy terms for real data mining – clustering, predictive analysis and so on. What I am saying here is don’t try to do something fancy in the beginning. Just take a look at your data from higher up – don’t focus on the little day to day things. If you track customer complaints are they coming from a specific area? Are they around a specific product? You might simply be selling into the wrong group. Do you track why you lose a deal? If so, study those results for trends. It might be as simple as picking the right day of the week to focus your calls. It’s all there for you to find. The secret is in knowing where to look. They say the economy is getting better and we think it is as well. However, it’s not as good as it was a few years back. So, we are doing everything we can to drive more business to our small world. One of the things we are doing quite a bit is email marketing. This is a tough thing to do and I’d thought I’d share some things I’ve gleaned over the past few months. We’re Sage ACT Consultants as I am sure my readers know. But what you may not know is we are Swiftpage Gold Consultants as well. Swiftpage is an Email Marketing firm that has a tight integration within ACT. We help customers set up email marketing campaigns and one day it occurred to me that we were not doing it ourselves. It was one of those “smack yourself on the forehead moments.” So, we recently sent out a couple of email marketing campaigns about our services and products. I was at first disappointed that our open rates were ONLY 30%. Only is in caps because what I originally thought was bad turned out to be actually pretty good. According to services who do this for a business, 30% is an awesome open rate. They say the norm is 4 to 8% for new lists and 8 to 10% for lists of people who have received mail from you before. Personally I want 100% but that’s just the type A overachiever in me. In retrospect, I’d be happy with 50%. With this as momentum I went on a scavenger hunt for tips to increase the open rate and to also find out why mine was higher than the norm. Based on what I’ve uncovered, here’s what I found. 1. Brand recognition helps – I sent my campaign out to people who know us – customers and resellers. That’s a huge factor and is the area where I am going to work the most to increase the open rate. It is a well known fact (at least to me) that it is cheaper to go after business from an existing client than to go after a new one. If I was sending this out to brand new prospects, I’d have to work harder to make people want to a)open my email and b)ensure I get past SPAM engines. 2. The subject line is KEY – if you get past the SPAM engines this is what will draw them into your email. It becomes your “here kitty kitty” plea to go see the great stuff you have painstakingly compiled in your awesome email. 3. Don’t overdo it. Sending out an email campaign every day is only going to ensure faster opt-outs. 4. Know your audience – do your homework and look for the buzzwords that will compel people to find out what you are offering/recommending/suggesting/ranting about. 5. Email marketing is getting harder – most people, including myself, hate SPAM and we get a lot of it. Spammers are getting very good at luring you into opening their emails. Heck, they may even be reading this blog post as we speak. Therefore be judicious in what you send out. Think over the topic and subject carefully and make sure you are sending out emails people actually will value and want to read. Here’s some tips I gleaned during my investigation and research. Check out and bookmark websites that show SPAM word lists. Copy them and keep them nearby when you are composing your email campaigns. I’ve listed one of my favorites below. Another thing to do is frequent sites whose business it is to do email marketing. This idea has a high “duh” factor associated with it. One of my favorite sites to research is Swiftpage.com. As noted before, since we are Swiftpage consultants and resellers it would figure I like their articles – but they really are very good. At the end of the article I have a great example from their site. Craft an amazing subject line. This is the place where you lure them in. If they don’t like the subject line, they won’t know if they like the content because they will have already deleted the email. Put a big part of your effort into building the right words, with the right length, that doesn’t scare away the recipient and doesn’t flag it as SPAM. That is why it is very important to know the SPAM words because the subject line is searched first. Plus, many people put in rules that take out emails with $$, buy now, etc in the header. Also, I’ve seen differing opinions on how many characters should be in your subject line. Some say no more than 40, some say cram as many words as possible into the subject. I’m going to give you my own personal preference – if it’s over 40 characters I’m passing. I have someone who sends me the world’s longest subject line and the email has absolutely nothing in the body. I guess it ensures I read what he wants me to read, but I still find it annoying. That’s just me. If you want people to visit your website or click on a link for more details, put it early in the body of your email. That way your key “call to action” has a higher chance of being implemented as well as be clear to your audience. An important rule is follow the KISS philosophy – keep it simple. Make your emails concise, clear, to the point and brief. If you want people to click on a link to read more about your product or service – say that. Click here for more details is pretty clear. And you can put a lot more information out on a linked page and not fill up the email with information better served on a broader space. While you are putting in your links don’t overwhelm your audience with too many. One or two should be sufficient. If you do more than that, people may never return back to your email. They will spend all their time on the first two links. Now, that may not be a problem – but if that wasn’t your ultimate goal – then you’ve lost them at the pass. That about sums it up. I am doing another email blast next week. I’m anxious to see if my research has paid off. The following post is from a guest blogger – Tony Berastegui. Over 95% of my clients have never met me face to face. You see, I work in inside sales and most, if not all of my business is done over the phone or by email. No opportunities for a handshake, lunch, or round of golf here. Yet, I have very good relationships with my current account base and always looking for new relationships with my new business efforts. How? Nothing beats face to face interactions, but there are very simple ways to build that relationship without ever meeting in person. Video phones would be the easiest solution. However, I mostly communicate with small to medium business owners where the good ol’ phone is king. Email is still very powerful when used correctly. However, the phone is still the best method to build that very important relationship. My customers buy because they like me. I sell a very common service in a competitive market and people don’t buy just on price. They want to work with someone they can trust, so in my case, building a strong relationship is crucial. So, when dealing with phone calls, I never rely on a script and every call is different. It has to be. Not everyone is equal and if you stick to a script, you may guarantee yourself that all the details will be delivered – but at what cost? Sounding like a robot, maybe. When I prospect or reach out to existing accounts I always take a minute to find something to talk about before I make the call. Current events, trade news, and yes, the weather are topics that I look for. ACT! helps me a lot with tracking notes for talking points for both prospects and clients. For example, Bill the plumber, lives in Alabama and he loves to talk about his son and his golf game. Well, right before I reach out to Bill to check on his latest order, I check my notes in ACT! and note that the last time we talked, Bill told me his son was breaking in his new golf driver. With that in mind, here is how I start that call. “Hey Bill! Tony here. So is the little guy hitting the big stick 200 yards yet?” This easily leads into my client talking about his son. He’s relaxed, the conversation is casual, the relationship maintained. Soon into that call, with a nice relaxed customer, I ease into the purpose of my call and work on getting a renewal on the account or an up-sell. You would think it would be easy to remember that Bill the plumber’s son plays golf. 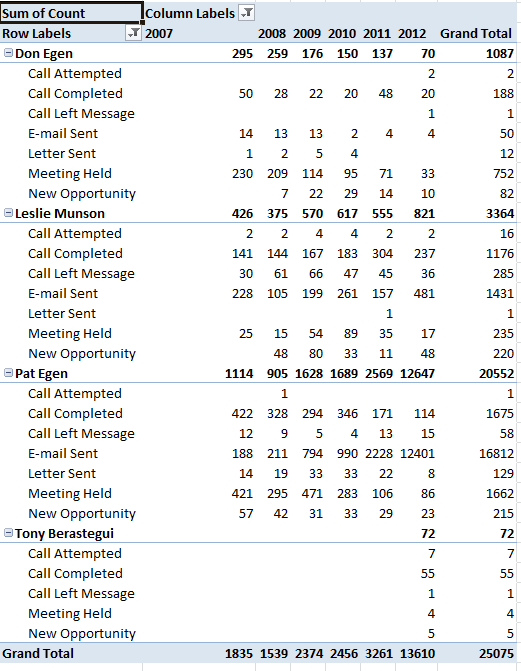 Well, did I mention that I make 80 outbound calls a day? My memory is pretty good, but my time is spent number crunching, proposal building, prospecting, you name it. That’s a lot to be thinking about. That’s why I need tools like ACT! to help me “remember” things important to my customer and me. Take the time to ask about the weather before you get into the business of the call. Take the time to take note of something that is of special interest to your prospect or client and start the call with that. The recipient of your call is just as busy as you are, and a little chat about junior’s golf swing is surely a welcome break. Good luck with your relationship building. Always remember to not forget the “R” in CRM is Relationships. Oh, and by the way, Phoenix was 105 today. Not to bad considering we hit 118 this summer. Happy selling.